When you go to your "My Account" page you will see a Welcome Back and your name headline on the top section. If you scroll down past the upcoming holidays and events you will see your "My Favorite" cards. When you like a card for any season or holiday, you can create this list here. This is very handy when you want to send something quickly. At the top of the page is a text button "Sent Cards" that allows you to see the history of all the people you have sent cards to and the cards you have sent. In that way, you will not duplicate your sending year after year. Yikes. Didn't see this. On the home page, click on the free trial banner and sign up. In 11 days it will shift to paid and you will be in. All subscriptions start with a free trial. Hello Steven. You have a wonderful product, but navigating your website is an exercise in frustration management. There are no easy ways to get to where I want to be. I can't easily find how to sign up for a membership, and how to enter in my credit card information. Even your instructions don't give a direct access to where you say I need to go! I hope you're not losing business, but I suspect you may be. I'm about to give up. I'm trying to change my credit card information, but there is no place in my account to do so. I have received instructions to open a menu item that isn't listed in my account menu. Since I have closed the card associated with this account, you may lose me as a member if I am no allowed to perform this simple operation. I can't find where to put my Address Book in, I go the My Account page and then I am directed to where I don't know because the instructions are so ambiguous. HELP!!!! CAN'T LOG IN - EVERY TIME I TRY - THE BLANK PAGE FOR LOG-IN APPEARS AGAIN! PLEASE HELP ME OUT! I give up too I tried for hours two days straight..UGG!!! 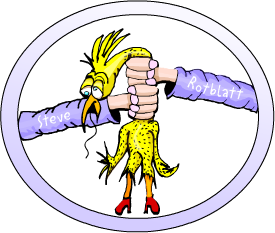 Stephen H. Foreman - I've had an account with Rubberchicken for 2-3 years now, have never had an iota of trouble, have always been satisfied. I can't login without it asking me to sign up for the free trial over and over. My feedback twice was the same response. Use chicken as the password which keeps giving me an error message that I entered the wrong password. I just want my money back for a service I can't use. This is frustrating, beyond words!! It is impossible to access my account to renew !!! I have never encountered a more difficult website! Why can't attention by paid to these website problems? It is great to be zany and an original thinker with the cards - not with the digital process and money transactions. Hire someone without a sense of humor to do something straightforward. very interesting....i submitted a complaint an hour ago, and now its missing from the website. i recieved an email apologizing for the mismanagement of cancelling an autorenewal of my account since it cant be done on the website despite instructions on how to do it. Now the whole string of complaints ( mine, and several others) are totallly eliminated from the string. thats not good and very corrupt. This is one of the most poorly designed websites I've ever used. Terribly frustrating, especially since these supposed instructions on how to use it are often useless. Sorry this is causing an issue for you. We try to make things clear and your input is necessary to make it so. Thanks!! "My account" sits on the menu on the top of the page. See attached image.